Floyd, Virginia is a small rural town located along the Blue Ridge Parkway. It has a reputation as an artistic community with a rich sense of place. Maintaining its unique character and scale while fostering a vibrant downtown requires foresight, planning and creative community development. 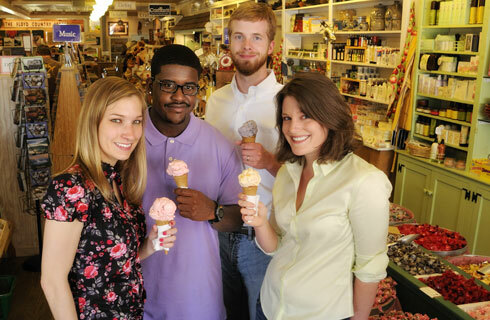 Recently, four Virginia Tech students embarked on a project to help develop and attract new sustainable businesses that uniquely match the community. The project began in a class called Economic Development Studio at Virginia Tech. The class gives urban planning graduate students a chance to engage the community and undertake real-world development projects. In 2009, the focus was on green building. The students began with a create-from-within approach. They wanted to boost the local economy with help from only local people and resources. After talking to the community, they determined that promoting economic development, reducing environmental impacts, and improving social well-being were the key goals. Eventually, the students developed four business recommendations that they presented to Floyd County—a wood pellet manufacturer, a micro-dairy (small-scale dairy specializing in simple cheeses), flooring and countertops manufacturing, and a “sustainable living” training and education center. The town of Floyd is currently considering which, if any, of the business proposals are most viable. However, even if none of them are adopted, the research the students have done has stimulated interest in sustainable economies and provided a foundation for development within the community. The Economic Development Studio project builds on a number of existing efforts the town of Floyd is making to improve sustainable development. The organization SustainFloyd sponsors a number of long-term projects, both independently and in conjunction with national programs such as Farm-to-School. For more information, please visit SustainFloyd’s Web site.